Lethal attacks prove a very wide jihadist network is active in Belgium, and the terror den lies in Molenbeek. Brussels has become infamous as a hotbed of Islamic extremism because of links to a series of recent attacks in Europe, and now the Belgian capital itself has suffered the worst ever terror attack in its history. The Islamic State (ISIS) attacks on the Brussels airport and metro system in which terrorists murdered around 35 people on Tuesday came just days after Salah Abdeslam, a key suspect in November's ISIS Paris attacks, was captured in the city after four months on the run. A large and often poorly integrated Muslim population with high levels of unemployment and crime - especially in the gritty district of Molenbeek where Abdeslam was found near his family home - has created a breeding ground for extremism. 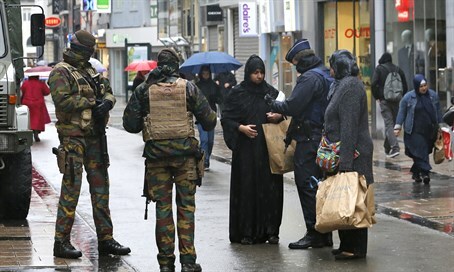 Analysts say that has metastized into a dedicated terror network in Belgium as many hardened jihadists return from fighting in Syria with ISIS and other extremist groups. "It is very likely that this attack will have been planned and prepared well in advance of last week's arrest of Salah Abdeslam, one of the central figures in the Paris attacks from last November," said Shiraz Maher, Senior Fellow at International Center for the Study of Radicalization (ICSR), King's College London, told AFP. "It therefore points to the existence of a broad and sophisticated terrorist network in Belgium, that extends beyond the one which attacked France last year," he added. He added: "Our research shows that, per capita, Belgium has the highest number of foreign fighters in Syria of any European country. More than twice as many have gone from there as from France, and more than four times as many as from Britain." "We feared a terror attack"
Molenbeek has been in the eye of the storm since it emerged that it was home to core members of the Paris attack squad. Police arrested Abdeslam on Friday just a block from the family home in Molenbeek, a district where he once ran a bar with his brother Brahim - who blew himself up during the attacks in the French capital in November. The suspected Paris ringleader, Abdelhamid Abaaoud, also hailed from Molenbeek and was a friend of Salah Abdeslam. As far back as 2001, it was in Molenbeek where the assassins of Afghanistan's anti-Taliban commander Ahmad Shah Massoud had stayed. It was also home to one of the 2004 Madrid train bombers and the main suspect in the 2014 Jewish Museum attack in Brussels, while the perpetrator of a foiled attack in August on an Amsterdam-Paris train stayed in Molenbeek with his sister before boarding in Brussels. But it is the sheer size of the network in Belgium that has emerged since the Paris attacks which has most alarmed officials. Not only was Abdeslam allegedly helped by several people after fleeing back to Brussels after the attacks, but the Paris cell had rented at least three properties around the country which were used to prepare the attacks. In the days after Abdeslam's arrest, Belgian authorities feared that a terror plot was afoot. "He was ready to restart something in Brussels, and it may be the reality because we have found a lot of weapons, heavy weapons, in the first investigations and we have found a new network around him in Brussels," Foreign Minister Didier Reynders said on Sunday. Alarmingly, prosecutors said on Monday that two bomb detonators were also found in a Brussels apartment raided last week. A grim-faced Prime Minister Charles Michel said on Tuesday: "We feared a terror attack and it happened."